Just think of what scientific advances Biff could have effected if he researched the dust-repellent paper in the 1950s. Whenever the subject of the "Back to the Future" movies comes up, I can't help but think that with all the super-duper technology they depicted in 2015 — even down to the voice-controlled house (similar to today's "Internet of Things" and Amazon's Alexa) — they never even *hinted* at smartphones. In that world that doesn't exist, people wouldn't have counterfactuals. Imagine a world without thought experiments. We should try doing without subjunctives. At any rate, the almanac doesn't explain Biff's success beyond sports betting. Even sticking to gambling, bookies would quickly stop taking his bets, and his wins would affect the odds and maybe even how sporting events themselves play out. Considering Back to the Future I Biff's success seems to be limited by his confidence, which is archtypical of an 80's movie bully. Which does leave the legitimate quest of why/how a moderately wealthy bully (from his gambling wins) got to be grand plutocrat of the United States? Anyone here ever get around to the BttF Telltale adventure game series? I hear they did not really live up to their potential and fell into the same old "three trials" patterns. It also seems they are the basis for some recent new comics. Quizatzhaderac wrote: At any rate, the almanac doesn't explain Biff's success beyond sports betting. Even sticking to gambling, bookies would quickly stop taking his bets, and his wins would affect the odds and maybe even how sporting events themselves play out. First of all, I never got the impression Biff was quite at the top tier of plutocracy, although I may be wrong. Secondly, after his first few wins what does he need a bookie for? He can move to Vegas and become a bookmaker himself. With his knowledge he could make bank as the house. Additionally, I would not be surprised if an Almanac boasting boxing and horseracing results on its cover would contain incidental information indicating how lucrative it would be to invest in Vegas real estate in the late '50s. Of course, none of this counters your strongest point that his actions will sooner or later change the sporting events themselves. jpers36 wrote: Secondly, after his first few wins what does he need a bookie for? He can move to Vegas and become a bookmaker himself. With his knowledge he could make bank as the house. Additionally, I would not be surprised if an Almanac boasting boxing and horseracing results on its cover would contain incidental information indicating how lucrative it would be to invest in Vegas real estate in the late '50s. More likely, once the bookies became convinced that he was infallible, they'd either "suggest" some sort of cooperative setup with Biff, or they'd allow him to keep winning just for the inside knowledge. Whatever money they paid out to Biff in either scenario would be more than offset by their ability to reliably fleece other customers. I once found a reasonable-seeming estimate of the butterfly effect. It started with the temporary cancellation of the gravitional effect of one electron at the edge of the known universe. That is a smaller effect than adding a whole Biff right here on earth. This change in gravity would affect the trajectories of air molecules, causing slightly different collisions, cascading to ever larger effects through positive Lyapunov exponents until after a few weeks global weather patterns would be different. Given the effect of weather on human behaviour, it seems likely that the changes would cascade to further domains. We don't really know how much of human history is sensitive to initial conditions, but sports in particular are fairly sensitive to chance. That's why they make good betting material, after all. Presumably, the games in an almanac would not even occur, let alone end as predicted. You guys forget that in the BTTF-verse, documents from the future change when you change the course of history that lead up to them. We see photos and newspapers change, and there's no reason to expect the Almanac would be any different. Whatever effects on the outcome of future events Biff's actions in the past make, those effects will be accounted for in the updated version of the future Almanac that past Biff still has with him. Consider if instead of the Almanac, future Biff had brought back just a newspaper that says "[team] Wins [sporting event]", but then did something that changed the outcome of that event. We'd expect, given the rest of BTTF, that that headline would change, and Biff would still know who wins the event, even though his actions changed the future he brought back a record of. Pfhorrest wrote: You guys forget that in the BTTF-verse, documents from the future change when you change the course of history that lead up to them. We see photos and newspapers change, and there's no reason to expect the Almanac would be any different. Whatever effects on the outcome of future events Biff's actions in the past make, those effects will be accounted for in the updated version of the future Almanac that past Biff still has with him. Neat. I never even thought of that. Of course, there's always the possibility that something he did along the way would actually cause the bankruptcy of the almanac's publisher. That sounds like a hilarious adventure: waking up one morning to find the almanac disappeared because a sudden inflow of capital owing to increased sales of sports-related literature caused the publisher to exit the industry and move into even more profitable lines of business. Zamfir wrote: I once found a reasonable-seeming estimate of the butterfly effect. It started with the temporary cancellation of the gravitational effect of one electron at the edge of the known universe. That is a smaller effect than adding a whole Biff right here on earth. [...] Presumably, the games in an almanac would not even occur, let alone end as predicted. 1. How much he can win with what optimal strategy (balancing betting maximum amounts on everything before the effect amplifies vs. preventing more conscious systems from neutralizing his advantage event faster). 2. How well he can detect the deterioration and time his exit during the phase when the bookies/public find out. At initial reveal, his predictions could be self-fulfilling even after the almanac advantage is negated, and even finishing with 60% success in multiple sports could lend him credence with investors who would follow his lead in other areas. 3. Is he going to think of any of this? Pfhorrest wrote: You guys forget that in the BTTF-verse, documents from the future change when you change the course of history that lead up to them. Following up on Jorpho's point, it might update and fade at the same time, or just lose the score sections if Biff's infallible predictions make everyone lose interest. Zamfir wrote: I once found a reasonable-seeming estimate of the butterfly effect. It started with the temporary cancellation of the gravitional effect of one electron at the edge of the known universe. That is a smaller effect than adding a whole Biff right here on earth. I extrapolate that sporting events wouldn't change as a result of Biff's success. However, he did do something to either get the 22nd Amendment repealed, or just made it otherwise ignorable (the result of a weakened court system, perhaps) which directly caused Nixon to still be President in 1983.
leagues indicate that they are probably not far wrong. sions! 1 After a tiny fraction of a second the collisions of the air molecules will thus have become quite different, but the difference is not visible to you. Not yet. Suppose that the air that we consider is in turbulent motion(all you need is a little bit of wind); then the sensitive dependence on initial condition present in turbulence will act on microscopic fluctuations of the sort created by the little devil (socalled thermal fluctuations) and magnify them. The net result is that after about a minute, suspending the gravitational effect of an electron at the confines of our universe has produced a macroscopic effect: the fine structure of turbulence (on a millimeter scale) is no longer quite the same. You still don’t notice anything, however. Not yet. But a change in the small-scale structure of turbulence will, in due time, produce a change in the large-scale structure. There are mechanisms for that, and one can estimate the time that they take using the Kolmogorov theory. (As I said, this theory cannot be quite correct, but it will give at least a reasonable order of magnitude.) Suppose that we are in a turbulent part of the atmosphere (a storm would be ideal). We can then expect that in a few hours or a day the imperceptible manipulation of the little devil has resulted in a change of the atmo- spheric turbulence on a scale of kilometers. This is now quite visible: the clouds have a different shape and the gusts of wind follow a different pattern. But perhaps you will say that this does not really alter the carefully planned course of your life. mosphere, what the little devil has achieved is still a rather in- significant change of initial condition. But we know that after a couple of weeks the change will have taken on global proportions . It's from David Ruelle. I have seen other experty remarks that the 'butterfly effect" does not exist - the weather is sensitive to initial conditions, but not on the scale of individual butterflies. More like, a single cloud. That might be new insight- the quote above is from 1991, and weather modelling made serious progress in between. But it could also be that Ruelle specifically points out that the disturbance has to be in a turbulent flow, that is part of large-scale atmospheric turbulence eddy. That's the ladder to link thermal fluctuations to kilometer-scale fluctuations. i don't see how anything on the edge of the known universe could affect earth within the next ~43 billion years. Mjb wrote: Following up on Jorpho's point, it might update and fade at the same time, or just lose the score sections if Biff's infallible predictions make everyone lose interest. If it fades, Biff's proficiency fades, and the rest of the world that retains a smidgen of interest is no longer constrained by Biff's success, so it fades back in as 'a future thing that is applicable'. In the particular chronophysics of BttF, this should result in something of a stable-ish self-supporting slightly vibrating paradox. mathmannix wrote: However, he did do something to either get the 22nd Amendment repealed, or just made it otherwise ignorable (the result of a weakened court system, perhaps) which directly caused Nixon to still be President in 1983. It wouldn't have been the first time. The 18th Amendment created Prohibition; the 21st Amendment repealed it. The 22nd Amendment established presidential term limits; why couldn't a fictional 28th Amendment have repealed it? The 22nd Amendment was created and ratified following FDR's unprecedented decision to seek and ultimately win a third term (and four years later, in the midst of WWII, a fourth). But I don't know if it necessarily addresses the possibility of a person seeking the office if someone has served in between (think of Grover Cleveland, the 22nd and 24th POTUS). While it clearly says "No person shall be elected to the office of the President more than twice" and that appears rather straightforward, keep in mind that the Second Amendment states that "...the right of the people to keep and bear Arms, shall not be infringed" — but with a qualifier referring to "A well regulated Militia...", which certainly seems to be consistently overlooked if not outright ignored. And if the courts etc. can ignore or re-interpret part of one amendment, why couldn't the same happen to another one? 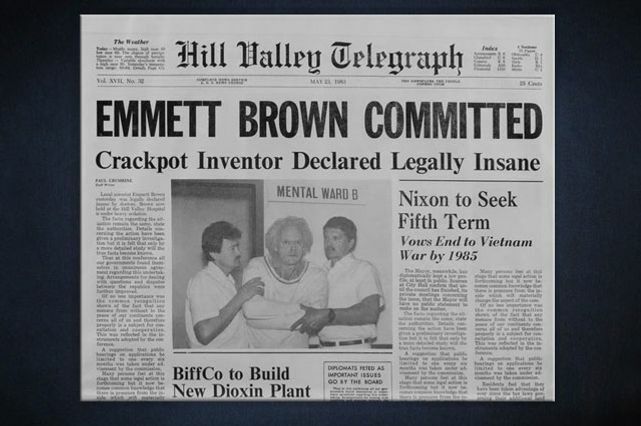 So if, in the BTTF universe, Nixon had come out of retirement and infamy to run again I'm sure that a Supreme Court ruling would have been rendered to settle the issue once and for all, and it's not too far-fetched to presume that they may have interpreted it to mean two *consecutive* terms. Quizatzhaderac wrote: There's also the possibility that he caused Nixon to lose one (or both) of the elections he won in Earth prime. It was 1985 Biff that got the almanac when he was told about it by 2015 Biff. He didn't begin using it until sometime after 1985, and by that time Nixon had already been elected twice and resigned in disgrace, so anything that happened after that had no bearing on events that had already occurred. Nope, it was 1955 Biff who got the almanac from 2015 Biff. By 1985, Biff had already been using the almanac to win at sports gambling for almost 30 years, and amassed huge amounts of power that way. cphite wrote: More likely, once the bookies became convinced that he was infallible, they'd either "suggest" some sort of cooperative setup with Biff, or they'd allow him to keep winning just for the inside knowledge. Whatever money they paid out to Biff in either scenario would be more than offset by their ability to reliably fleece other customers. I think you have unreasonably high opinions of bookies. Biff would have ended up as part of the foundations of a casino the first time he won more than a couple of hundred dollars. "No person shall be elected to the office of the President more than twice"
I always figured that I'd get elected for two terms, then run as Veep with an obvious stooge who resigns on Day One, thus allowing my 95% approving population to keep me in office forever! [for those pedants who claim the 22nd would keep me from running for Veep: I'll run a stooge pair. Day Two: POTUS appoints me Veep. Or, if you want to be slightly less evil, sneak the two away to a tropical island base simultaneously for a 4 year vacation that nobody knows about. Machiavelli teaches us to never do our enemies a small harm, lest we leave them able to destroy us in vengeance. The evil overlord list says the same thing, but phrases it as a hero rising up against us. History teaches us that banishing heads of state to remote islands results in them returning and taking over again 50% of the time (sample size of 2). Bond movies teach us that we'll just produce a super villain who carves their face into a volcano. Video games teach us that as few as two bad dudes knowing the truth can rescue the president. Putin teaches us that if you can trust the president to obey you, ruling from the shadows works no matter how obvious. Nope, the headline specifically says "Nixon to Seek Fifth Term". As in, he won in 1968, 1972, 1976, and 1980, and intends to run again in 1984. First off... a couple hundred bucks? That's kind of on the low end to start putting people into walls... You'd spend more than that in cement; not to mention hush money for the crew who did the work. Second... bookies aren't stupid... especially not the ones who can get people made into building materials. They'd recognize a sure moneymaker when they saw it and make him an offer that he couldn't refuse. Okay, I guess the 22nd is out then. Also, it's really surprising that somebody being committed is the main story, and not the new plant in town or the presidential election. I'll also assume that the back to the future authors don't actually understand what "legally insane" means and they just mean that he's been involuntarily committed. I can't really read the actual copy from the picture, but it it appears to be actual text (not just loren ipsum) and it doesn't seem to discuss him committing a felony. ...the most disturbing part is the implication that it's a whole chemical plant that actually produces dioxins, as a product. No useful output, just deadly carcinogens, for no dang reason. No, the MOST disturbing part is that building and operating such a plant is expected to generate a profit. Just who is buying thousands of tons of dioxin per year? Is President Nixon perhaps planning to finally win the Vietnam War by spraying it onto the Viet Cong’s croplands? ijuin wrote: No, the MOST disturbing part is that building and operating such a plant is expected to generate a profit. Just who is buying thousands of tons of dioxin per year? Is President Nixon perhaps planning to finally win the Vietnam War by spraying it onto the Viet Cong’s croplands? As a BTTF fan, I'll say that this must be most disappointing comic titled "Biff Tannen" that ever appeared on the face of the earth. This thread, though, is wonderful. Totally worth it. Quizatzhaderac wrote: Machiavelli teaches us to never do our enemies a small harm, lest we leave them able to destroy us in vengeance. Taking a vacation on the island was not a metaphor for putting them in an elaborate prison / death trap. It is an actual reward for a job well done! Umbrella drinks on the beach most of the day, indoor massage when the spy satellites are going overhead. Quizatzhaderac wrote: True enough. Although to address your early post, I don't actually want to be less evil. I try to be a decent person in reality, so I have sate all my diabolical urges in counter-factual universe. If you have a taste for deduction as well, have you considered Mafia in the local forum games? Hard to understand why a local loon getting committed would be front page news given those other stories. Is this one of those "What about her emails" things?